Lowdell was a 24-year-old bargeman who lived in Bow Common. (Bargemen carried goods on the river, while watermen carried people.) He worked on a barge called the William and Mary, and jumped off it to rescue a boy who had fallen into the river. However, although he was a good swimmer, he was never seen alive again: it seems he got trapped under a boat moored alongside. More happily, the boy was saved by the crew of another boat. His body was found about a month later by James Law at Battle Bridge Stairs, near London Bridge. Law, a waterman, spotted the body in the water and towed it ashore where it was identified as Lowdell, a man who had saved several other people from drowning in the past. The state of the body was described at the inquest: tattoos on the arms, a broken nose caused after death, and the trousers down below the knees. However, nothing more seems to have been said about the strange state of his dress; it may have been that he was attempting to remove his waterlogged clothing as he drowned. 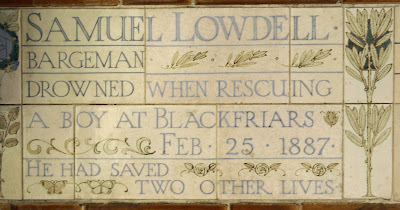 The Royal Humane Society sent an award to Lowdell's widow. I very much enjoy reading this series of postings, and visited Postman's Park recently for the first time. Those wall plaques are quite unexpected.